What does it take to be successful with digital marketing videos these days? If you’re pursuing a video marketing strategy, you should realize that video doesn’t connect with audiences the same way that emails, blog posts, and websites do. Marketing videos should tell a story while involving your prospect as the Hero. Make it personal. Show how your product or service is used to solve the Hero’s current problem. In essence, you’re the Guide in every piece of video marketing content. It’s a vastly different perspective to helping your customers on their journey and should be approached with this uniqueness in mind. Simply converting your written content to video format isn’t going to have the same effect. 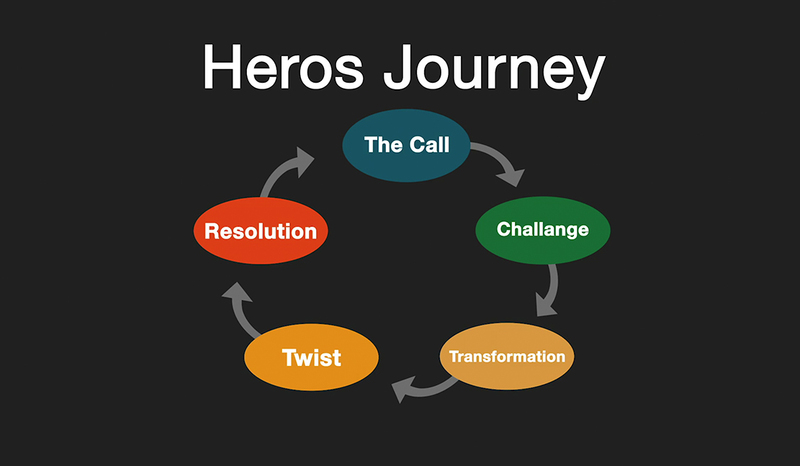 That’s why we’re trading the traditional buyers journey in a sales funnel in favor of the Hero Journey, a five-phase pattern of an archetypal Hero and how it applies to telling your brand’s story or selling your product or service. Referred to as the “Awareness Phase” in a standard sales funnel, the Call is your chance to make a strong first impression and generate interest in the viewer. This portion of your video strategy should be used to grab attention and provide education and insight on the problems you solve. Explainer videos are a popular option for the Call. These are short, to the point, entertaining, and easily understood, even when dealing with complex topics that viewers are just now being introduced to. The Hero sees that you understand where they are. Likened to the “Interest Phase” of the sales funnel, the Challenge should introduce your product, service, event, or webinar. This is where you should generate some buzz about what you’re offering so the viewer can further connect their problem with how your product is the guide to help them. In this type of video (or portion of a longer video), in the viewer’s problem or mission it becomes clear that you can help them. They realize they must do something about whatever is standing in their way, but can’t do it without you. The Transformation phase (known as the Desire phase in traditional funnels) should continue to build desire in the viewer. They finally start to see themselves at the finish line (higher aspiration) with their problem solved and having the ability to overcome adversity. One technique here is to compare other products to what you’re offering and explain why they’re not the best solution. You’re still generating interest in your product or service while helping the viewer understand how what you’re offering is the best fit to help solve their problem. Also known as the “Doubt/Trust phase”, the Twist gives you a chance to reaffirm their interest by giving them proof why you’re the real deal. This comes at a crucial time when the viewer may suddenly start to doubt your authenticity or that the prospect of solving their problem is too good to be true. The rational to stay in their current situation seems better than rising to their higher aspiration. Fear of change becomes real! Your timely reaffirmation videos could come in the form of customer testimonials, a message about your company culture, answering frequently asked questions, or personalizing your message or offer. The Resolution phase is when your viewer takes action. They’ve completed the Hero’s Journey and can finally reap the rewards of engaging with you as their guide through your video marketing strategy. Their problems are solved, and you have a new customer to show for it. Hero: Where are they now and what do they want (aspiration)? The guide shouldn’t stop here. At this point, your video campaign may offer instructional or troubleshooting tips, an onboarding guide, or other information to help them make the most of their investment in you. Just like a real hero would experience, this Hero’s Journey in marketing videos is never a straight path. It can repeat itself over and over, calling viewers on new journeys for more opportunities to solve their problems and remain triumphant. Keep the journey going, and you’ll ever remain the the go to guide.